I decided to write my own obituary, why you might ask? Because I am paying for it, and also because someone might write a glowing review of my life that one might expect I’d rise from the dead - LOL. The truth is, in life I just tried to do the best I could, some good decisions, others maybe not so good. I grew up in Spokane, attending Longfellow Elementary and Rogers H.S, until I enlisted in the United States Air Force, and served from 1956 - 1960. 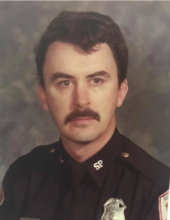 Then, I served the good citizens of Spokane on the Spokane Police Department from 1961 - 1993. I had a good run! I am survived by my 7 children: Kathi (Don), Carrie (David), Sandi (Mike), Jeff, Scott, Kristen, and Rick (Jamie). I maybe have not always liked them, but I’ve certainly always loved them with everything I had! Thankfully, they all turned out well, with jobs and aren’t in jail (and that is a BIG deal for a former police officer!) With all these kids, you can imagine I’ve got too many grandkids and great grandkids to count, but I love them all dearly, and couldn’t have been a prouder Papa. I am also survived by my dear sister, Janet (Ed). I’d like to send a special thank you to Dr. Tod Green and his nurse Carol, for all of the great care they’ve provided me over the years. And last but not least, to my wife of 49 years, Karen who is the most loving, caring, and generous wife, friend, and companion a person could ask for - you are the love of my life. In lieu of flowers, I’d ask that donations be made on my behalf to the Spokane Regional Law Enforcement Museum located at 924 W. Sinto Ave, Spokane, WA 99201, or Spokane Meals on Wheels. To send flowers or a remembrance gift to the family of Richard H Welch, please visit our Tribute Store. "Email Address" would like to share the life celebration of Richard H Welch. Click on the "link" to go to share a favorite memory or leave a condolence message for the family.